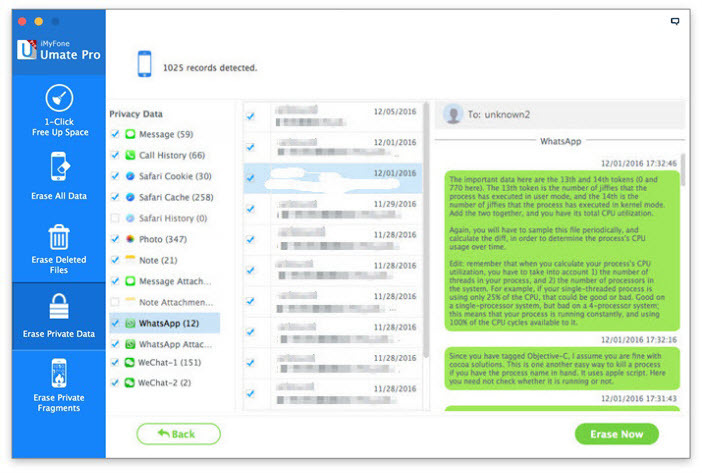 bits-en-pieces: Repost: Now Don’t Worry About Storage & Privacy with iMyFone Umate Pro! 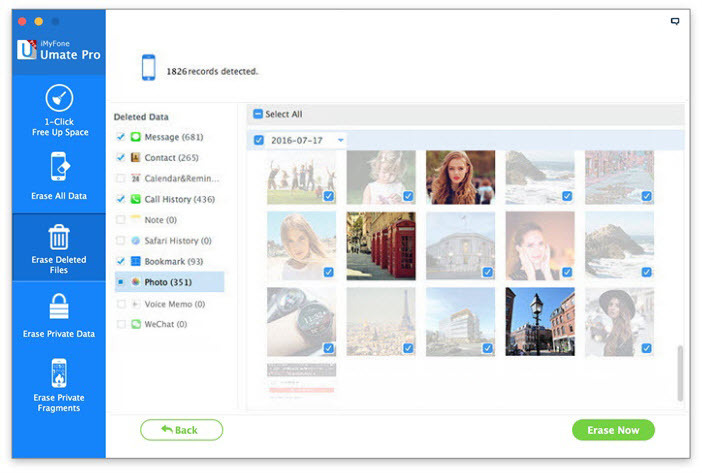 Repost: Now Don’t Worry About Storage & Privacy with iMyFone Umate Pro! Disclaimer: Repost Article from http://technofaq.org. Privacy & Storage are major concerns for most of the iPhone users. While you can get extra storage by paying out more money, there is nothing you can do about privacy. 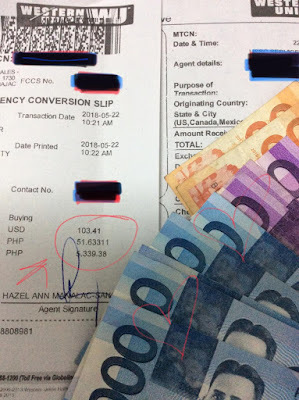 Is it fair to pay extra money just for storage? Imagine if there was a way through which you don’t need to worry about storage anymore. It would give you a mild shock when you will get to know that images & videos which you have deleted from your iPhone can easily be restored. If you thought that ‘Delete All Data’ in settings will delete all the data and your phone is safe & secure to be sold to a stranger, think again. Identity Theft is a major issue with smartphones and few simple tools can recover all the deleted data. With so many apps taking an important place in our life, it has become mandatory to keep these apps on your phone all the time. With regular updates and increasing apps, most of the storage is used up by these apps and the junk data of these apps. Thanks to excellent camera quality of iPhone, a minute video will take up GB’s of storage. 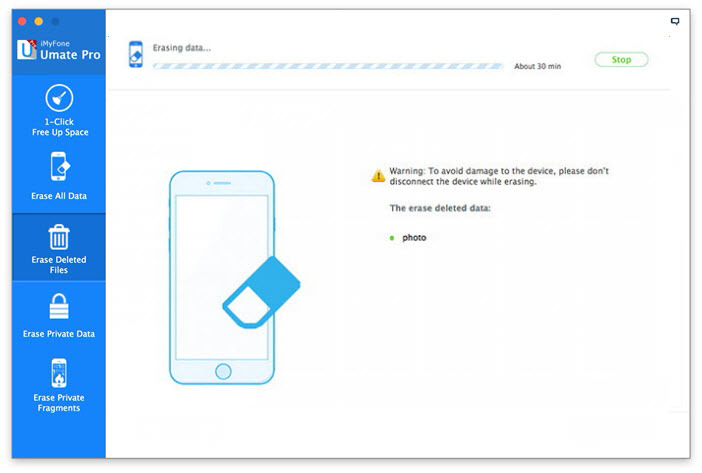 iMyFone Umate Pro is an excellent method to clean up free space in your iPhone along with keeping your data safe & secure. It can be used for many purposes like deleting Junk files, temporary files, large files etc. and can also help in deleting the ‘Deleted Data’. This feature helps in removing junk & temporary files. It also helps in creating additional space as it can compress and delete the images. 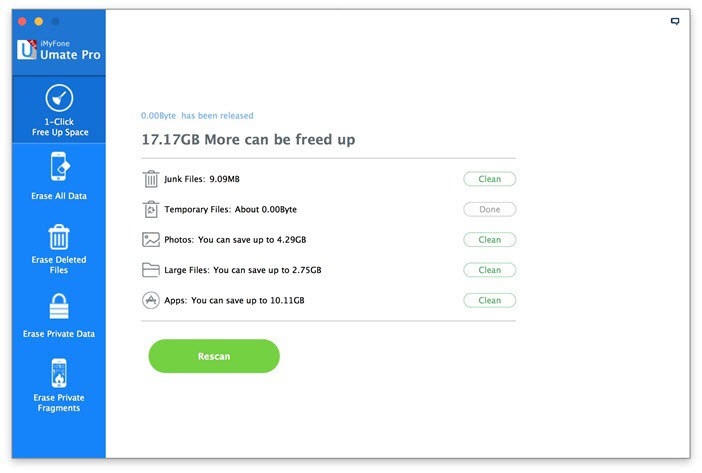 It can clean up junk files, erase temporary files, compress photos, delete/backup large files and can remove unused apps. 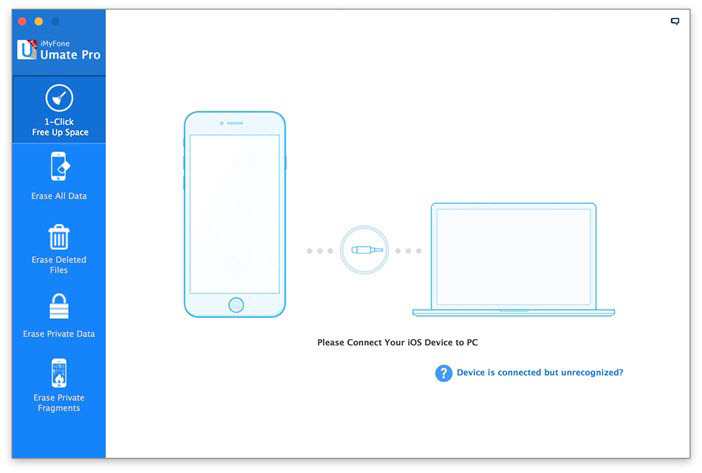 Step 1: Run iMyFone Umate Pro on your Mac and connect your iPhone via USB Cable. 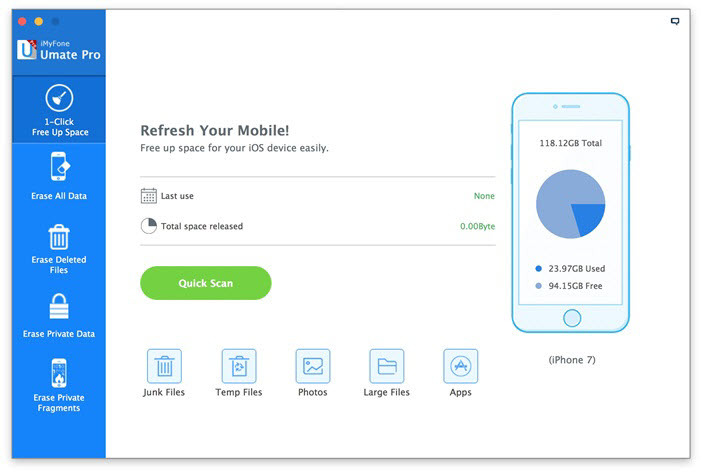 Step 2: Click on ‘Quick Scan’ & it will start scanning your device to check how much storage can be saved. Step 3: Now, it will show you how much of space you can make by deleting the files. 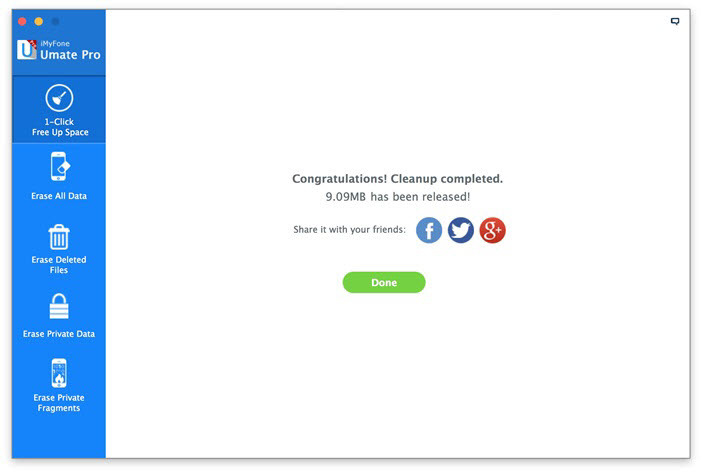 Just click on ‘Clean’ & it will start deleting the files to make space. Step 4: Once you have cleaned all the files, it will show you how much of space you have created by deleting these unwanted files. 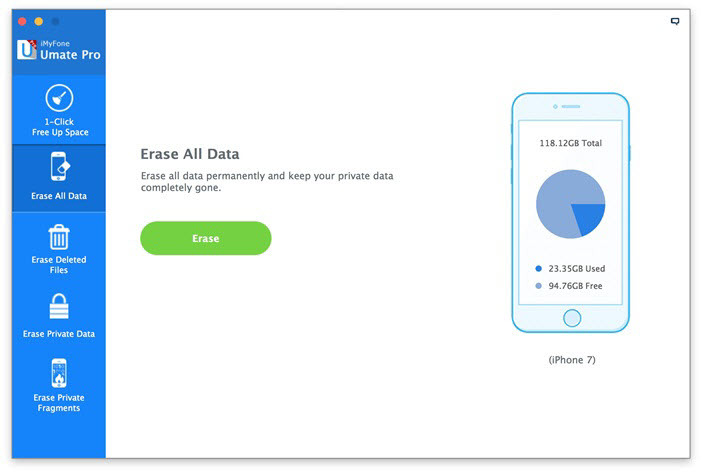 This feature will delete everything on your iPhone. 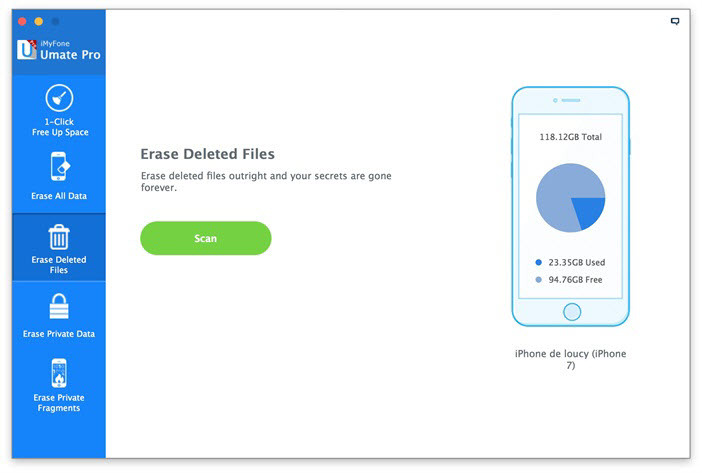 This feature can wipe out the entire things stored on your iPhone and if you are planning to erase all the data permanently, you can use this feature. Since it will erase all the data, we suggest you take a backup or be extra cautious while using this or you may end up losing important data. Step 2: Click on Erase All Data option present at the left side. After that click on ‘Erase’. Step 3: Since this will delete all the data, it will ask you to confirm it and for doing that you need to type ‘delete’. 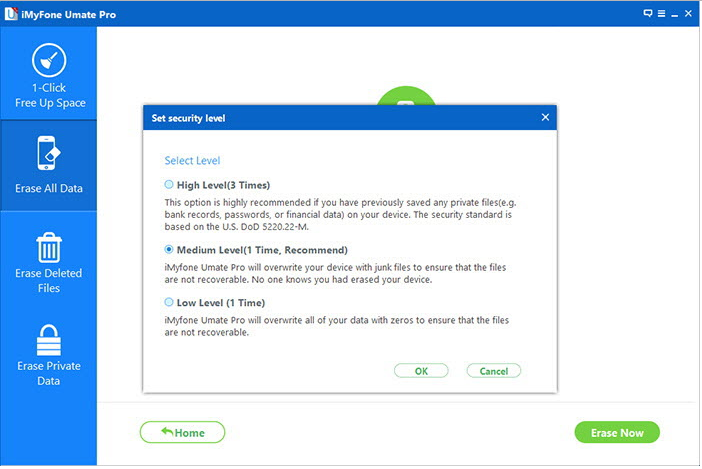 Step 4: You can also change the security level. There are three levels of security. You can choose the security level as per your choice & need. The Medium Security Level is selected by default and is also recommended. 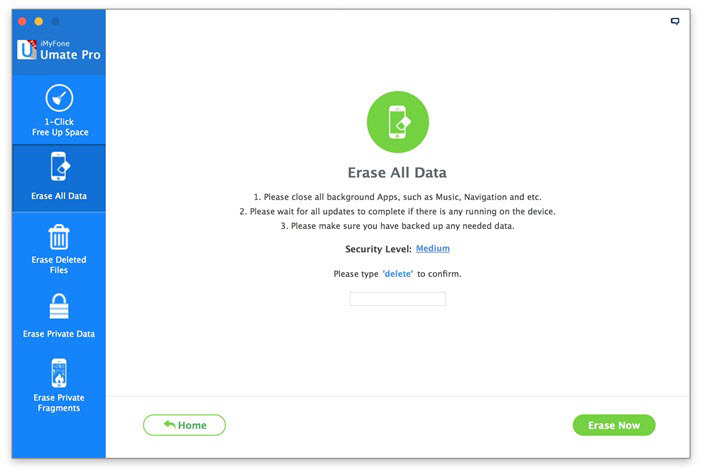 Step 5: Once you have selected the security level, click on ‘Erase Now’ & it will start erasing all the data. 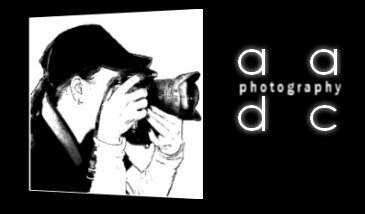 There are many tools available in the market which can recover the deleted images. This feature of iMyFone Unmate Pro helps in erasing the deleted files so that files once deleted can’t be recovered by any method or tool. Step 2: Now select the third options on the left side which is ‘Erase Deleted Files’. After that, click on ‘Scan’ button and it will start scanning the device and show you the list of all deleted files which can be recovered easily. Step 3: Choose the files which you wish to delete permanently. You can also preview the files. iMyFone Umate Pro will choose all the files by default for erasing so you can unselect the files which you don’t wish to delete. Step 4: You must type ‘delete’ to confirm the erasing of deleted data. Once you type ‘delete’ & click on ‘Erase Now’ button, it will start erasing the selected files. Your Phone contains very sensitive data which if misused can cause big problems for you. Thanks to iMyFone Umate pro you don’t need to worry about this anymore. It can easily erase all private data like account information, SMS, emails, chats, browsing history etc. You don’t need to worry as it will delete this data for once and all which can never be recovered. 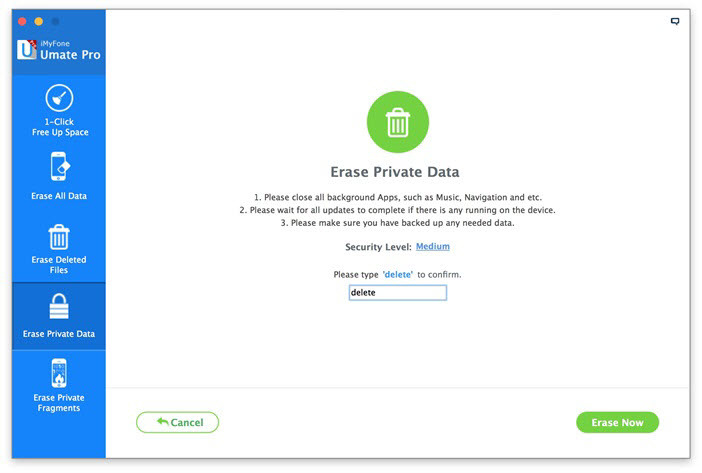 Step 2: Now choose the fourth options on the left side which is ‘Erase Private Data’. After that, click ‘Scan’ and it will start scanning your phone. 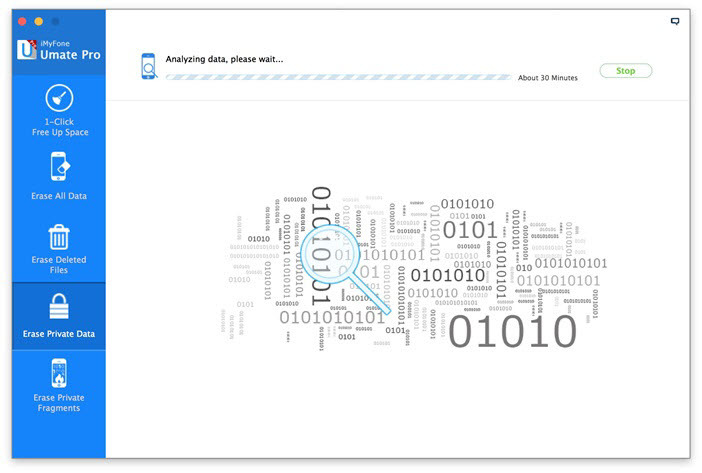 Step 3: Once a scan is completed, it will show you all your private data which include photos, notes, messages etc. This data can also be previewed. You can select the files which you want to erase. 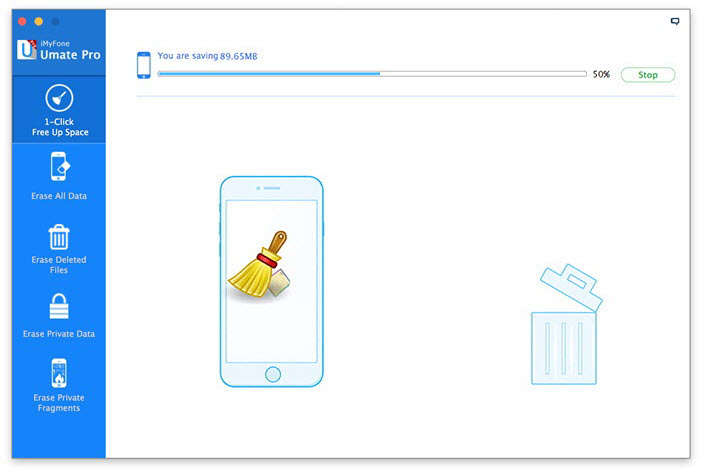 Step 4: Click on ‘Erase Now’ button and type ‘delete’ to proceed. 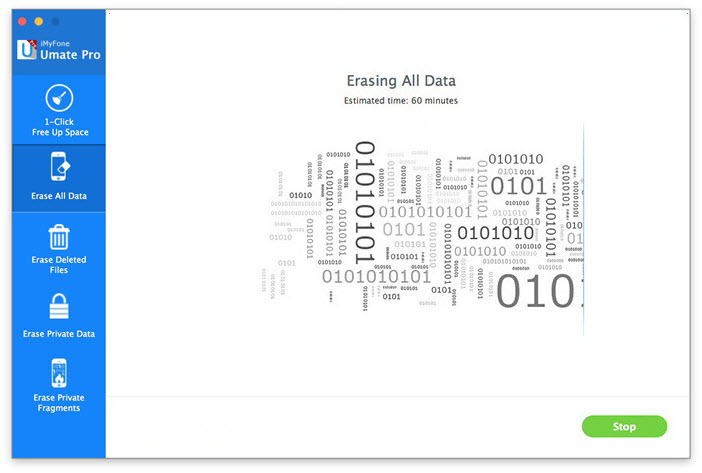 After that click on ‘Erase now’ and it will start erasing the selected data. iMyFone Umate Pro can help you a lot if you remain worried about your private data & storage. The best part about it is that you can select the data which you wish to keep and which you wish to delete. It also allows you to preview the data before taking any actions. 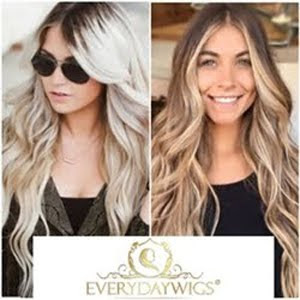 You can check out the trial version before buying the actual software. It is available for both Mac & for Windows.